Thin-film sensors are based on the same principle as strain gauges, which are grid-type resistance structures whose geometric stretching and compression result in a measurable resistance change due to length and thickness differences induced. For a thin-film sensor, four resistors are arranged on a diaphragm in the form of a Wheatstone bridge to detect the deformation of the diaphragm under pressure. In the ‘thin-film process’, these strain gauges are attached onto a (e.g. metallic) base element and structured (sputtering with associated photolithography and etching). Thick-film sensors, like thin-film sensors, use four resistors grouped to form a Wheatstone bridge. The resistance structures are “printed” onto a base element (e.g. ceramic base) using thick-film technology, and afterwards they are burnt-in at high temperature. The resistance change here is also due to the deformation of the diaphragm, resulting from the geometrical change caused by the stretching and compression of the material. 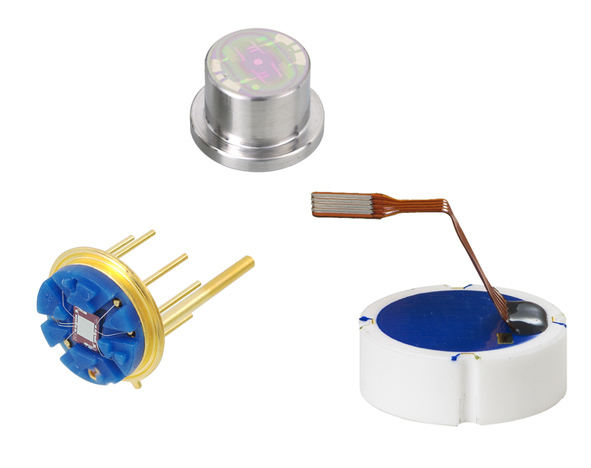 Piezoresistive sensors, in contrast to the first two principles, utilize a semiconductor (silicon) measuring diaphragm with selectively diffused structures. They use the piezoresistive effect, which is based on the change in electrical resistance in the semiconductor materials caused by the stretching and compression, which affects the mobility of the electrons under the mechanical stress. Due to the different materials and design principles, there are also technological differences which may be important in some applications. Basically, WIKA products always use the most appropriate measuring principle with regard to the nature of the respective application. Should you have further questions regarding a specific measuring task, please contact us.